Term 4 Graduation in December 2015 presented awards to graduates from Diplôme de Commis Cuisinier and Diplôme de Commis Pâtissier programmes. The occasion was grace by the presence of Dr. Khamis Saleh Al-Bulushi, Cultural Attaché at the Embassy of Sultanate of Oman and company in view of the graduation of their first 4 students sponsored by the Royal Military of Oman. Dr. Khamis Saleh Al-Bulushia also presented a especial Plaque to commemorate the historical moment. Also for the first time, Mr. Mohamed Elsayeh, General Manager of Swiss Garden Beach Resort, Damai Laut was invited to give a short talk about Menu Engineering to our graduating students. Mr. Mohamed Elsayeh was the General Manager of many highly acclaimed 5 Star Hotel such as Pangkor Laut Resort and a number of Ritz - Carton Hotels, including Bahrain, Japan, Marina Del Rey, USA and Half Moon Bay, USA. gave a brief overview of its application much to the delight of those present. 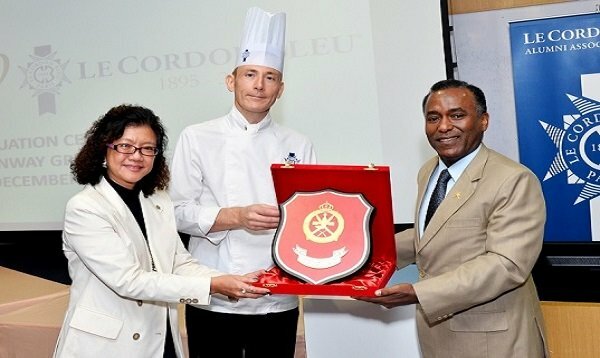 A total of 31 Diplomas were presented by the respective Chef Instructors comprising of Technical Director & Cuisine Chef Instructor, Chef Rodolphe Onno and Cuisine Chef Instructor, Chef David Morris for the Diplôme de Commis Cuisinier students whilst the Regional Director for Le Cordon Bleu International, and Executive Master Chef Fabrice Danniel and Pastry Chef Instructor, Chef Florian Guillemenot presented awards to Diplôme de Patisserie Cuisinier students. Our top student award for Diplôme de Commis Cuisinier was Leonardo Chandra while the top student award for Diplôme de Commis Pâtissier was to Goh Shern Jim.